Comments: The gray myotis is a cave-dwelling bat that found a summer home in the storm-water drainage system of Pittsburg, Kansas where an estimated 2,000-3,000 individuals live. In addition, about 100 females use these tunnels as a nursery site. The bats feed on flying insects over water and follow riparian woodland corridors to get to foraging sites. The summer haunts are at different locales than the winter hibernation caves. Some of the summer resident gray myotis from Pittsburg were banded and found hibernating during winter months in caves of northwest Arkansas. 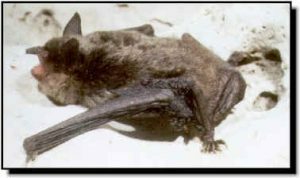 This bat hibernates in clusters with densities that average 170 bats per square foot. The gray myotis is known to live as long as 14-15 years. Common threats to bats include loss of habitat, pesticide residues, and human disturbance. Researchers have documented declines greater than 60 percent in gray myotis populations in Tennessee, Kentucky, Alabama, Missouri, and Arkansas.